The Boom Remote is a companion app for Boom 2 and Boom 3D, the most popular system-wide audio booster for Mac. With the Boom Remote on your iPhone or iPad (iOS 9 and later), you get to wirelessly control your favorite Boom 2 and Boom 3D features in addition to other well known Mac apps like Spotify, VLC, QuickTime and iTunes. Simply connect your iPhone or iPad to the same WiFi network as your Mac and watch the magic unfold! This remote gives you the convenience of being able to wirelessly change the volume, toggle equalizers and effects as well as control playback on other Mac media apps from anywhere in your home. The best part is that you only need to have Boom 3D installed on your Mac for you to enjoy these features from the comfort of your seat. 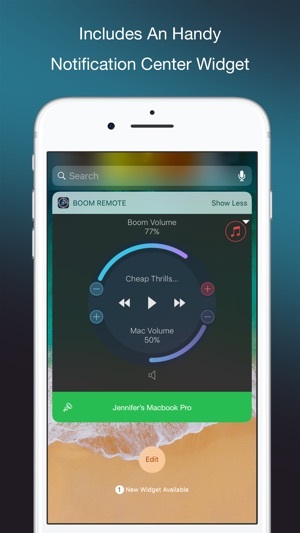 This app is perfect for when you’re away from your Mac and watching a movie, playing and changing tracks and just about any other situation where you simply want to wirelessly control your favorite Boom features. 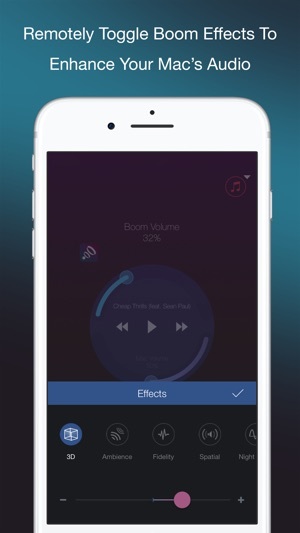 Note: Boom Remote runs only when paired with Boom 2 (v1.2.1) and later and Boom 3D (V1.1) and later on the Mac. With such a great Mac software I’d think the developers would have fixed this problem? Please fix this for us. Thank you. Hey, make sure you have also updated the Mac version of Boom 3D. Restart your Mac and WiFi connection and then try connecting remote app and check if it helps. If the issue still persists, contact our Support Team for further help. It needs phone Audi for bathroom breaks. © 2008 - 2017, Global Delight Technologies Pvt. Ltd.